One of the things that we need to think about is the future of leadership. Traditionally, organizations have reserved coaching for people at the top levels. They use them as developmental tools to help leaders grow and the overall organization to grow. But our job as leaders is to get the very best out of the workforce that we invite into our organizations to help us be successful. And often we don’t invest in their growth and development at the more junior levels. We just hope that when they come to us with their existing skillset, they’re going to help us be successful. And we know that hope isn’t a strategy. A couple shows back we had New York Times Best Selling Author Kevin Kruse on the show and had a great discussion about the importance of employee engagement. And one of the best ways to engage your employees is going to be to coach them, to invest in them, to show them that they are the cornerstone not only to your success as a leader but to the organization’s success as well. The days of command and control and leading from positions of authority are over. And we now need to invest in and coach our workforce to get the very best out of them. When we get the very best out of them, they are satisfied. When they are satisfied, they are engaged. When they engaged, they become more productive. The end result is that they deliver the very best experience to our clients and customers. 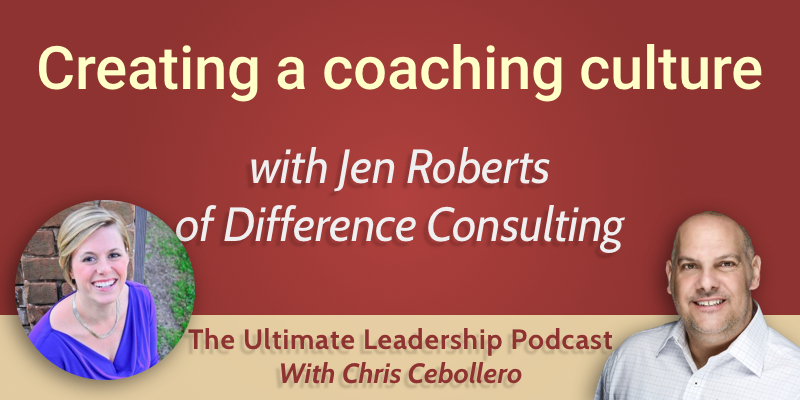 Today I’m very excited to welcome back Jen Roberts, the president and founder of Difference Consulting, a company specializing in helping companies build, develop and leverage the unique talents of their own people and teams internally through strategic consulting, executive coaching and proprietary leadership development programs. She is a member of the Forbes Coaches Council, an accomplished author, and you can read her stuff on such websites as Forbes and the Association for Talent Development. We had a really great show with Jen a few weeks back, and we’re excited to have her back with us today. What are some of the typical behaviors that managers employ to drive engagement in performance today? Why is it important for senior leaders to create a coaching culture within their organizations? What are some of the benefits of fostering a coaching culture? When we talk about building a coaching culture within organizations, it’s really about companies focusing on building amazing managers and giving them the skills to be able to create environments where their employees love to work and can really perform at their best. Typically, manager approach employees in a kind of ‘command and control’ approach. It’s not because they want to display their authority or power in their position necessarily, but because of the speed of business. We are moving so fast and organizations are growing so quickly in size and complexity that they’re just trying to keep their head above water. Often managers unintentionally become their own worst enemies in the way that they approach their employees. So rather than creating a coaching environment, it can often be more of a dictatorial style or management. The speed of business often leaves managers with a lack of time, which means that they are often not able to develop and coach the workforce. As leaders, it’s our job to free up those folks to take care of our most precious resource: the workforce. When you think about the word “leadership”, by definition it is simply an interaction where influence occurs. This influence can be positive or negative, with minimal or maximal impact. So in order to create a coaching culture within an organization, we have to take focused action to develop leaders who choose to use their power to influence and impact others in a positive way. Leaders often underestimate the power of their actions and the influence on their team members. And then they end up using it ineffectively. Leaders are operating in crisis mode. People in the workforce will tell you that they don’t have enough hours in the day to do their own work, much less direct the work of their employees. With the best of intentions, it is easy to overlook the development and training of critical thinking skills that allow them to then work more autonomously. Leaders unintentionally undermine other managers’ decisions, which can have a detrimental impact on their credibility. If they’re working on a high stakes project that isn’t being completed fast enough, they will jump in to help before allowing the workforce to find the right path themselves. They often perpetuate a risk-averse environment – there is an unwritten rule that ‘failure isn’t an option’ because the manager is being judged in terms of their performance through the performance of their employees. A lot of managers don’t delegate effectively, making themselves a bottleneck rather than empowering their team to take action autonomously. All these mistakes, while done with good intentions, will not allow the workforce to learn and grow to become more autonomous. Mentoring is really more about a leader sharing his/her experiences and observations. It’s more of an advisory position rather than asking empowering questions that help them come to a solution which will, in turn, apply to future problems in the future. When you’re coaching an employee you are helping them maximise their potential and find ways to be able to solve problems without a manager having to be involved each and every time. It’s hard to get the best people now. And once you’ve hired your team members, it really takes great managers to keep them happy and engaged. So failing to develop those managers throughout the organization can create a large growth barrier. Once businesses grow in size and complexity and with the global nature of business these days, it’s increasingly important to develop managers’ skills and help them drive autonomy and innovation within their teams. Previously in the near past, we have been focused on being very lean operationally. More and more managers now are being promoted with little or no formal leadership development before moving into the positions. And moral and engagement have suffered as a result because these managers aren’t great at what they do – it takes great managers to keep people engaged and happy. In a recent Gallop pole, 85% of disengaged employees felt that they didn’t receive enough coaching. It is so important to give managers those skills to create a happy and engaged workforce. Because poor management leads to good people leaving organizations. When you think a company that does this exceptionally well, you think about Google. They have explored this topic before and applied all their data analytics capabilities to their people decisions. When they looked to solve some of the engineering problems that they had, they learned that what people were looking for was periodic one-on-one coaching. When their employees were asked, that was considered key to becoming a good leader and engineer. The biggest initial benefit is that managers have better self-awareness, they are more effective in their individual communications with their team members and other managers. It can give those managers a common framework and language that builds cohesion and alignment within the leadership team. Ultimately for the employees, what it creates is a workforce that focuses on solutions rather than problems. You have leaders, managers, and employees at all levels that own part of the business and are personally invested in its continued success. And that allows managers to extend greater trust to their employees to work more autonomously – which we know is important because we have teams that are physically separated and you don’t have the manager in meetings face to face. With the right training and development, you allow your employees to make autonomous decisions, which creates buy-in and develops a sense of ownership of the company or project. The type of leadership culture you create doesn’t happen by accident. It happens because you are intentionally focused on reinforcing behaviors so that they get perpetuated throughout the environment. So having the top leaders of an organization go first and start by modelling those types of behaviors, generates that buy-in and an environment where people feel safe in practising those types of skills where it may not have been the case in previous management generations. Be intentional about creating a people development strategy that aligns with your company’s core values and your organizational goals. When you have that strategic alignment in place it becomes much easier to drive those behaviors and reinforce them because there is a process and framework in place. It can be really helpful to partner with an external consulting firm that specialises in teams creating these strategies. It starts at the top: training senior leaders and managers on how to model those coaching behaviors so that they can then empower managers to take action. Start by teaching senior leaders some coaching basics like listening or asking empowering questions to their management members or building buy-in. At Difference Consulting, Jen’s team offers a proprietary 5-step communication model that they help leaders work through. They guide those leaders to coach their most respected and valued team members – and as those top influencers within the organization gain traction by being coached, they become more open to learning and modelling those same types of coaching behaviors within their own teams. Educate the managers on the benefits of coaching within their own leadership teams. You need your managers to be bought into the process. Create a plan of accountability – and follow up. Culture change initiatives don’t happen overnight. It takes some time to take hold. Create a plan of accountability to ensure the implementation of the plan and then to evaluate the program for continuous improvement opportunities. Most importantly, it’s best to start with the top leaders within the organization because when employees see them practice the behaviors that they are expecting further down the chain, then it helps them to be bought-in. Also, it is critical to align your strategy with your company’s core values and goals. When you’re following an alignment framework, it shows people the value of what they’re doing and why it is important to the company achieving its goals. Organizations with strong coaching cultures really demonstrate that they value their employees and supporting them at all levels. Visit the Difference Consulting website and schedule a complimentary discovery call. There is also a free framework tool to begin getting started.